Andres Manuel Lopez Obrador, known as Amlo, is the frontrunner in the election. A left-wing nationalist known as "Amlo" is poised to become Mexico's next president and shake up the status quo with his promises to transform his country, including its relationship with the United States. The latest polls from Mexican newspaper Reforma show Andres Manuel Lopez Obrador, commonly known by the acronym of his initials, maintains a substantial lead over his nearest rival, Ricardo Anaya of the center-right National Action Party (PAN). A victory for Lopez Obrador in the July 1 vote could spell big change to Mexico's political landscape with potential implications to U.S.-Mexico ties. Born in the southern state of Tabasco, Lopez Obrador is hardly new to Mexico's political scene. The 64-year-old leftist began his political career over 40 years ago as a member of Mexico's ruling Institutional Revolutionary Party (PRI), which governed the nation uninterruptedly for much of the 20th century and returned to power in 2012 with the election of President Enrique Pena Nieto. Lopez Obrador ultimately joined a left-leaning splinter group of the centrist ruling party that later formed the Party of the Democratic Revolution (PRD). He rose to prominence in 2000 when he was elected mayor of his country's capital, Mexico City. During his five-year tenure as mayor, Lopez Obrador ran a moderate administration but won over the hearts of the poor and working classes by expanding local social programs. He helped build a new public university, cut the salaries of city officials, subsidized subway fares and provided financial support to senior citizens, single mothers, the unemployed and the disabled. (Alfredo Estrella/AFP/Getty Images) Mexico's presidential candidate for the MORENA party, Andres Manuel Lopez Obrador, waves to supporters during a campaign rally in Puebla, Mexico, June 23, 2018. Next, Lopez Obrador set his eyes on the presidency. He first ran for president in 2006, vowing to "put the poor first." But he narrowly lost as his opponents painted him as Mexico's own Hugo Chavez, the late leader of Venezuela who ruled the oil-dependent nation for 14 years with populist policies and increasingly authoritarian tactics. 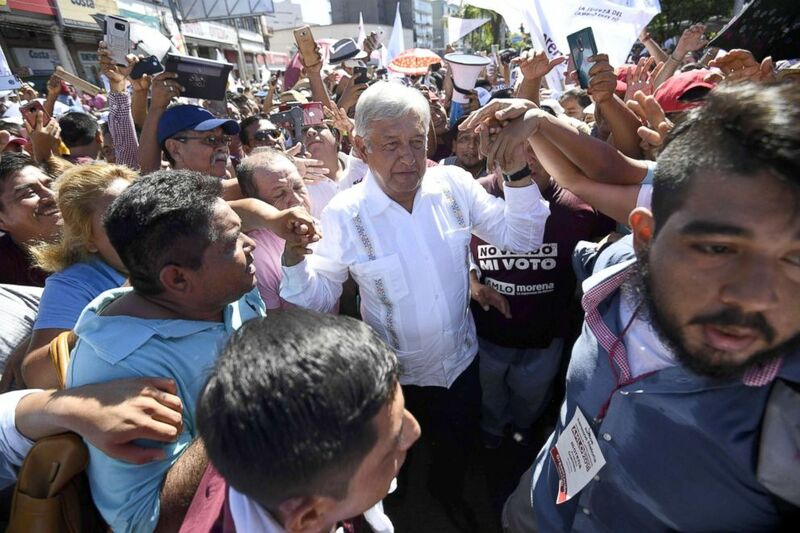 Lopez Obrador exacerbated this perception in the months following the election when he demanded a manual recount of all votes, called for nationwide protests and allowed supporters to proclaim him the "legitimate president." He ran for president a second time in 2012 but was defeated again. He subsequently withdrew from the PRD and founded a new left-wing party, the National Regeneration Movement (MORENA). This time, Lopez Obrador has attempted to reinvent his image with a more moderate platform. The three-time presidential candidate is running for a three-party coalition called Together We Will Make History. And he appears to have softened his populist views while marketing himself as the anti-establishment, anti-corruption candidate who will clean up government and quash the country's violent criminal gangs. Alfonso Romo, a Mexican businessman who is Lopez Obrador's top economic adviser, told ABC News he first met the politician in 2011 and was surprised by his "depth of knowledge of Mexico." Romo described him as a "very honest man" who understands "exactly the needs of the people." "I met a social leader, not a politician," Romo told ABC News in a recent interview. "A man that loves his people, that understands Mexico." Romo said Lopez Obrador "is not a populist" and will run a moderate government focusing on economic growth, security issues as well as rampant graft and bribery. Mexico has grappled with escalating violence in recent years, since the government launched a militarized crack down on drug cartels, causing them to splinter into smaller but increasingly ruthless rival gangs. There were 29,168 murders in 2017, more than in 2011 at the height of Mexico's drug war, according to data from the interior ministry. It's the highest homicide rate the country has seen in decades, and the toll for 2018 is already on track to surpass it. "The biggest challenge we have is to resolve the problem of security and the violence," Romo said. "We cannot guarantee a prosperous Mexico if we don't resolve this." 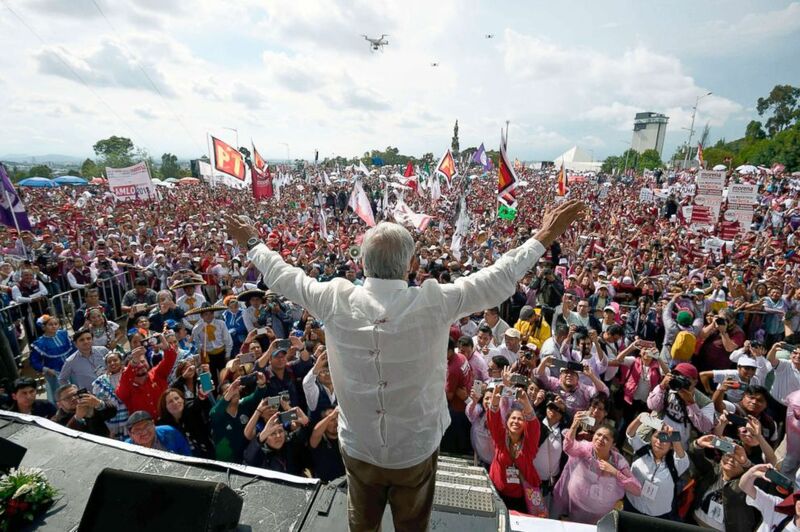 (Alfredo Estrella/AFP/Getty Images) Ahead of the July 1 presidential election, Mexico's presidential candidate for the MORENA party, Andres Manuel Lopez Obrador, greets supporters during a campaign rally in Acapulco, Guerrero State, Mexico, on June 25, 2018. Lopez Obrador is also campaigning for shifting Mexico's relationship with the United States. The frontrunner has promised to reduce Mexico's political-economic dependence on foreign powers and to put President Donald Trump "in his place." The United States is Mexico's largest trading partner by far, but the bilateral relationship has been shaky since Trump stepped forward on the world stage. The U.S. president described Mexican immigrants as "rapists" during his 2016 election campaign and continuously claims he will make Mexico pay for the construction of a border wall. Not long after Trump's inauguration, Lopez Obrador published a book titled "Oye, Trump," or "Listen Up, Trump" in English, a compilation of speeches he had recently made in several U.S. cities. During one of them, he said, "Trump and his advisers speak of the Mexicans the way Hitler and the Nazis referred to the Jews, just before undertaking the infamous persecution and the abominable extermination." Lopez Obrador's approach to the Trump administration could be a radical departure from Mexico's outgoing president, Pena Nieto, who has been very cautious about pushing back against Trump and has tried to maintain strong relations with the United States. "We need to be firm, we need to be patient," Romo told ABC News, when asked how Lopez Obrador would deal with Trump. If elected president, Lopez Obrador would meet with Trump and try to convince him that a prosperous relation would serve both of their countries, but there needs to be "mutual cooperation" and "mutual respect," Romo said. "We have 3,000 km in common borders, we have centuries of relations, mutual investments," he told ABC News. "They have some advantages, some technologies we don't have, we have something that they don't have." "We cannot give up in this enormous opportunity in building one of the most powerful regions in the world." ABC News' Jose Cohen in Mexico City contributed to this report.